Maybe some of you have a picky eater in the house. My daughter will try most things. My four-year-old son has a new reason everyday for why he won’t eat. To borrow a line from the movie A Christmas Story, “my son works in reasons why he won’t eat the way other artists might work in oils or clay. 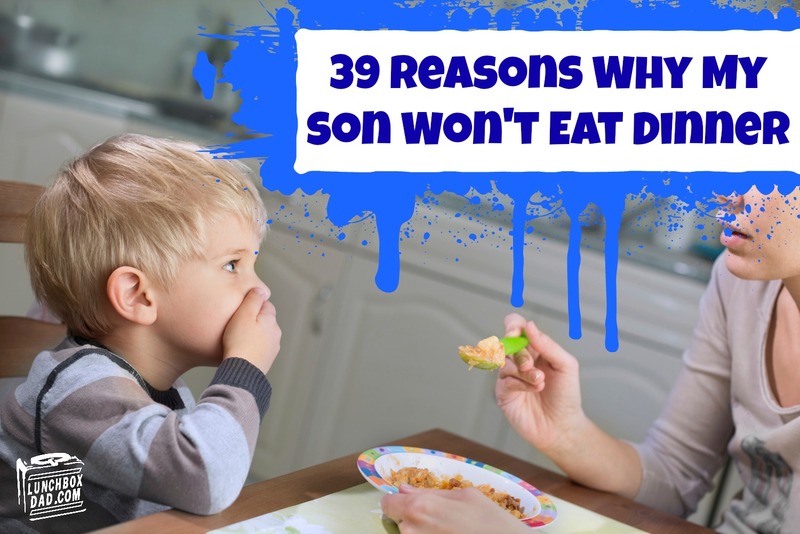 He’s a true master.” Here are 39 reasons why my son won’t eat dinner. What are some reasons that your kids have given? Let me know in the comments! 1. I don’t want a baby spoon. 2. This spoon is too big. 3. Mommy makes it better. 6. I want a big boy cup. 7. I spilled my drink. 9. Daddy makes it better. 10. Cantaloupe makes my lips tingle. 11. This plain pasta with butter is too spicy. 12. I’m tired, can I be done? 13. I only like blue carrots. 14. I’m not tired anymore I just want dessert! 15. I’m not hungry for dinner, can I have a snack? 16. I don’t like salad (said if any microscopic speck of green anything is spotted on his food). 17. Oops! The dog ate my dinner! 18. I gave the dog my fruit, he looked hungry. 19. I gave the floor my food, it looked hungry. 20. She looked at me. 21. He looked at me. 24. The dog looked at me. 25. I don’t like yellow scrambled eggs. 27. Sister won’t sit next to me. 28. I’m a chocolatarian, I only eat chocolate (ok, I made this one up but I’m positive it’s coming soon). 30. I don’t like "THOSE" strawberries. 31. What are you making? Whatever it is I don’t like that. 32. Can I have milk in my cereal? 33. Why did you put milk in my cereal? 34. How come she gets more? I want more...I’m full I don’t want my food. 35. I liked tomatoes yesterday, not today. 36. I don’t like this plate. 37. I only want the one bowl in the house that is impossible to find right now. 39. This food came within one inch of touching another food. The whole plate is now yucky.